We saw lots of drama in the last few days regarding Samsung Galaxy Nexus release on Verizon US network, about its name and price. But everything is end by the official announcement by Verizon itself. You can place your order for the only Android 4.0 running droid phone with next day shipping from both the Verizon on Amazon websites in the US. Obviously you have to sign a 2 year contract with Verizon and pay $299.99 which is their normal rate for high-end phones. If signing a lengthy contract is too much boring fro you $650 is the Verizon asking price. But I have a great news for the Nexus lovers. One online retailer LetsTalk, just offering $154.99 for new Samsung Galaxy Nexus if you sign a new contract, which is nearly half the regular asking price of the smartphone. If you are a Verizon subscriber, looking to upgrade, you'd have to pay an extra $20, but the price still remains unbeatable. All you need to do to get the discounted rate from LetsTalk is insert the code $75VZN at checkout. 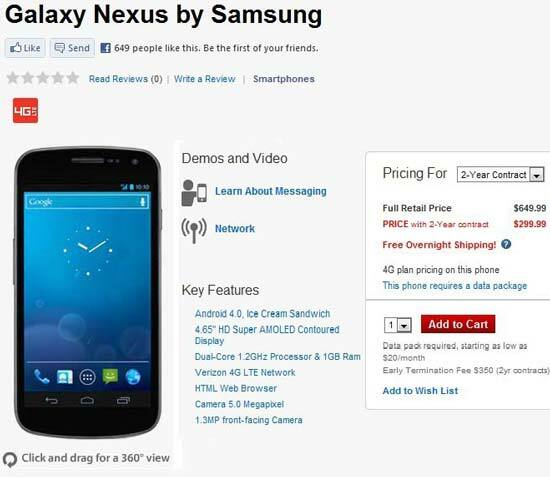 Verizon creates a nice simulation page for Samsung Galaxy Nexus. If you want to buy it then you can look there. If you don’t get the chance to buy it then it is compulsory for you to check the site! Because you will see the latest Android OS there. At the same time Verizon also announces the white version of Motorola DROID RAZR. Read the PR for more. BASKING RIDGE, NJ — Verizon Wireless, Samsung Telecommunications America (Samsung Mobile) and Google™ announced Galaxy™ Nexus™ is available starting today in Verizon Wireless Communications Stores and online at www.verizonwireless.com for $299.99 with a new two-year customer agreement. Google, Nexus, Android, YouTube, Google, Gmail, Google Maps, Google Earth, Google Calendar, and Android Market are trademarks of Google, Inc.